AUTHOR INFORMATION: David Dalglish is the author of the popular Half Orc fantasy series and the Paladin series. He was born in Fort Lauderdale, Florida. He graduated from Missouri Southern State University in 2006 with a degree in Mathematics and used to work with Special Education students. He lives with his family in Missouri; A Dance Of Cloaks is his traditional publication debut. BOOK BLURB: Thren Felhorn is the greatest assassin of his time. Marshalling the thieves’ guilds under his control, he declares war against the Trifect, an allegiance of wealthy and powerful nobles. FORMAT/INFO: A Dance of Cloaks is 452 pages long divided over thirty-six numbered chapters with a prologue & epilogue. Narration is in the third person via several different point-of-views, both major characters and supporting ones as well, including the main protagonist Aaron Felhom, Thren Felhom, Alyssa Gemcroft, Kayla, Veliana, Maynard Gemcroft, Robert Haern, Gerand, Torgar, Madelyn Keenan and many other minor players. A Dance of Cloaks is the first book in the Shadowdance series which will be a total of six books. The book ends on a clean note but clearly indicates there is more to follow! October 8, 2013 marks the North American publication of A Dance of Cloaks in trade paperback and ebook format via Orbit Books. Cover art is provided by Michael Frost and Gene Mollica. ANALYSIS: I read this book nearly two years ago and since then have counted myself as a David Dalglish fan. It was to my great pleasure that Orbit Books picked him & his books focusing on Haern the Watcher. I had previously reviewed this book and so this re-review will be mostly similar to that with a bit of alterations as have been done to the book. While I had initially read the book, I was certainly struck by its fast pace, constant plot switches and mainly the unpredictability it brought to the table. A bit of history before one reads this book, the tale is set in the world of Dezrel, the same one of the Half-Orc and Paladin series however any new reader can jump into this book and have no problem with it [I did the same]. It focuses on the character of Aaron Felhom who is in line to be the heir to Thren Felhom, the leader of the Spider Guild and a thoroughly deadly individual. This book details the growth of Aaron Felhorn into becoming the deadly individual that some readers have already met in Book 2 of the Half Orc series. Secondly this is book one in a hexalogy and therefore over the next few books, his entire transformational journey will be gloriously shown. This book and the books to follow each have a standalone plot and and over-arching storyline that is basically about life, destiny and the choices one makes. Firstly there are four primary story threads ongoing in this tale, the first one focuses on Thren and his relentless march to wipeout the Tri-fect [businessman troika running the city of Veldaren & nearby regions] and secure a kingdom for himself, the second one focuses on Aaron, Thren’s heir and who is rather forced to learn how to become an effective ruler, the third thread focuses on Maynard Gemcroft, who is worried about his daughter Alyssa and about the precarious nature of his house and lastly Alyssa who is willful and faces danger through her choices. There are a few more characters but I feel to spell it all out would ruin the charm of this book. For most characters, nothing goes out as planned and the atmosphere prevalent is one wherein the reader will be forced to think about each character’s motives and plans. The author does a fine job of constantly switching the tale's focus and keeping the reader hooked with various twists and new POV characters. I was very surprised by this book as I simply went in without any assumptions, and yet I was completely blown away by the writing and overall plot. The prose is not of the flowery kind and is more economical in it's approach. The world settings is not explored much beyond the city of Veldaren but then you hardly notice as the action and intrigue never lets up. The world is much deeper than imagined and we do get glimpses and conversations of other things rummaging on the background but readers will have to wait to discover them in the sequential books or read the author's other books. In this new edition of the story, the author adds in several subtle touches and hints in regards to the world and the books to come. I could detect them as I had read the latter books and have an idea of what's to come next. For newer readers, it should be a fun experience trying to discover more about the world and these characters. The author has a very action-packed plot that has a huge climax in the end. For all lovers of Jon Sprunk, Brent Weeks or Peter V. Brett, this book is one that should be up right up your alley. Talking about the characters, the author presents a large cast and while Aaron is supposed to be the protagonist of this story, there will be others who can take on this mantle as well. Plus the main antagonist, Thren Felhorn is a formidable character on his own & very fascinating to read about. Readers will get to know him better when the short story collection "Cloak and Spider" releases in December. I enjoyed the strong characterizations of the story as the author shows a grim world but filled with fascinating people. Negative points if any were almost negligible on my end, not that this book is a masterpiece and will be counted as the next “A Game of Thrones”. What it is though; a fine book from an upcoming writer who read the aforementioned book and crafted a worthy tale set in his world. There are a few tropes which have been utilized here but again they have been presented in such a way that you do not cringe. Some readers might be a bit thrown off by the number of POV characters introduced in the book, also a couple of characters make an appearance after being introduced in the earlier half, but then again its not difficult to read and find out what they are up to. Another thing the author is guilty of; is that of finding the tale is longer than he imagined it to be, but considering his inspiration, this can be easily forgiven. 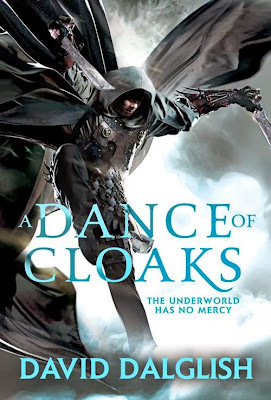 CONCLUSION: A Dance of Cloaks is a gritty book with intriguing characters and has a plot which will keep you hooked till the very end. David Dalglish will definitely be gaining new fans with the traditional release of this book and I can foresee him ascending new heights and being counted as one of fantasy’s rising stars. NOTE: Previously when this book was announced, I was interested in knowing how other bloggers would find this book. So I was glad when Melissa and Blodeuedd agreed to review this book & their thoughts can be found at My World In Words and Pages and Book Girl Of Mur-y Castell. Dalglish needs Mathias' cover artist. They keep talking about these covers as if they are not just another guy in a cloak. The cover of Through the Wildwood is the gem of recent covers. Dalglish needs Mathias' cover artist. They keep talking about these covers as if they are not just another guy in a cloak. The cover of Through the Wildwood is the gem of recent covers. "David Sullivan"
Hey, Mathias. Haven't seen you around for a while. Looks like you're still fighting the good fight, eh? Um... that wasn't me, and If you haven't seen me around in a while, you must not be a real Fantasy Book Critic fan. I had a guest post here just three days ago. As for David Sullivan's comment, while I agree that some covers are better than others, what is between the covers, is all that is important. Oh and thanks Anonymous, Anton Kokarev is the artist who made the cover, of mine, you mentioned. I have to say though, that, Dalglish's Half-Orc series covers are pretty damn good.